Eurol Racing RX | Eurol B.V.
A new technology, especially developed for long and short-stroke 4T methanol fuelled speedway motorcycles. Racing RX is also very suitable for go-kart racing as a ‘top competition’ oil which assures a lasting lubrication at high rpm. 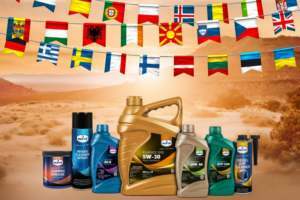 Moreover, the oil withstands high loads and high temperatures as it is manufactured with selected synthetic and natural base oils. In combination with specifically chosen racing additives, the blend assures a strong lubricating film and a perfect lubrication.